If you like the Hacking Christianity Facebook page, then you get easy access to relevant images and links along with the blog posts–Like this one above! “The conservative is a necessary element in human society. Without him we start blank. But without the radical, life stops with the past and we lack progress. The prophet is usually the radical, wanting to apply values to wider ranges of life. He strives to break the molds of the past and strives to give the privileges of the few to the many. In any society both of these, the conservative and the radical, are necessary. If we were all conservative, we would dry up, and if we were all radical, we would bust up. But between the backward pull of the conservative and the forward pull of the radical we make progress in a middle direction. 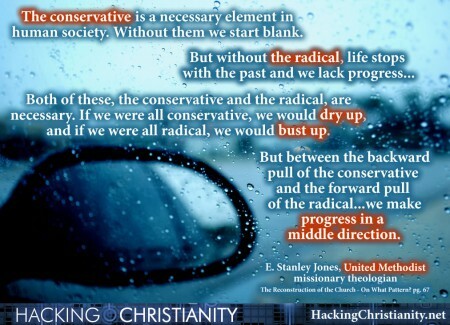 The Christian faith is both radical and conservative by its very nature. The center of Christian faith is a person. Jesus was conservative and Jesus was radical. -E. Stanley Jones, The Reconstruction of the Church – On What Pattern? pg 67. C911! Church Looking Over Online Shoulders?